"Prayer of the Little Bird".. it's so sweet! Reminded me of the bird families in our yard. The prayer is from the much loved book, Prayers From the Ark. 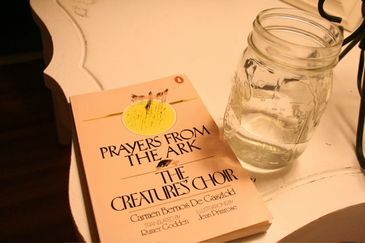 It has all these charming prayers from animals to insects... from the starfish to the goat, from the cat to the butterfly to the ant. The lady who translated it is Rumer Godden. She found the poems while helping nuns clean out cabinets at their convent. And the original writer is a French nun, Carmen Bernos de Gazstold. How neat is that! cake, artist, garden, apron and dress! Bird land again...all these birds are singing "Sound of Music". Love love the movie and could watch it over and over again. The music below the birds has the music from "Climb Every Mountain" and I put the part in "Follow every rainbow, until you find your dream." Oh, love that quote! So that sums it up for today.... Birds and Pippi have been my inspiration. "The Hills are Alive with the Sound of Music" is coming later this week. Had a fun time today painting the inspiration to that song...makes me want to run around on a hill in Switzerland when I look at the painting! Thanks again to my treasure fairy who sent me via mail, the wonderful "Sound of Music" sheet music! Oh, I also have other ideas about books and music... want to do some sort of Anne of Green Gables and a Pride and Prejudice painting, but still thinking through. It's hard to paint Mr. Darcy... but it would be funny to put one his quotes in a painting.... This quote is not for a painting, but is a great one. It's when he is talking about Elizabeth before her really fell in love with her....."She is tolerable; but not handsome enough to tempt me; and I am in no humor at present to give consequence to young ladies who are slighted by other men..." Or maybe it should be this one, "I cannot fix on the hour, or the spot, or the look, or the words, which laid the foundation. It is too long ago. I was in the middle before I knew that I had begun." How did I go from bird prayers to Mr. Darcy?.. wow! Oh well.. shows how my brain works! Happy boppity spring day to you!